Vehicle Insurance Temporary Laborers / Workers Academia / Extension Program Business Services 8 LC DBM Product Profiles Academia / Extension Program 8 Associations 12 Events 12 Product Search Engine 10 Research Materials 12 Software: - General Design 10 - Plant Selection 10 Temporary Laborers / Workers 8 Vehicle Insurance 8 Website Design 10 World Premiere Find this logo on World Premiere product photos. See ad on page 9 Information Request # 9452 Progressive Commercial www.progressivecommercial.com 877-656-7707 Complete business insurance in one place. In addition to vehicle insurance, we offer general liability, business owners policies and workers' compensation insurance. Call for a fast free quote from our Progressive Advantage Business program. 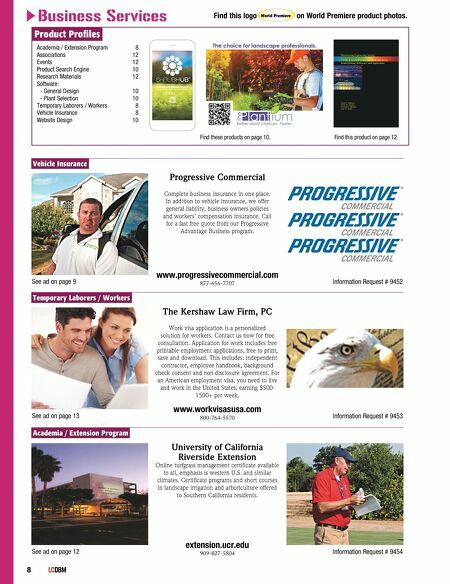 See ad on page 13 Information Request # 9453 The Kershaw Law Firm, PC www.workvisasusa.com 800-764-5570 Work visa application is a personalized solution for workers. Contact us now for free consultation. Application for work includes free printable employment applications, free to print, save and download. This includes: independent contractor, employee handbook, background check consent and non-disclosure agreement. For an American employment visa, you need to live and work in the United States, earning $500- 1500+ per week. See ad on page 12 Information Request # 9454 University of California Riverside Extension extension.ucr.edu 909-827-5804 Online turfgrass management certificate available to all, emphasis is western U.S. and similar climates. Certificate programs and short courses in landscape irrigation and arboriculture offered to Southern California residents. Find this product on page 12. 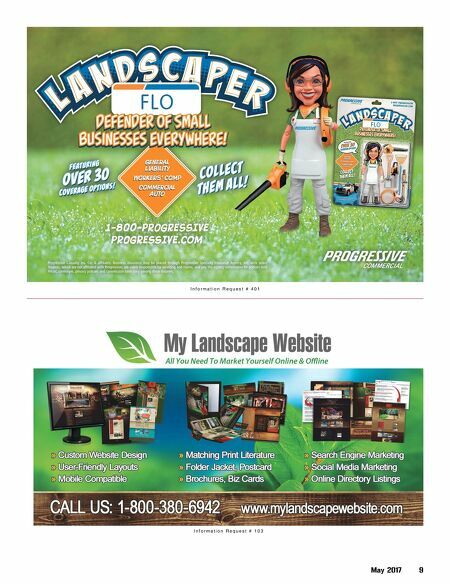 Find these products on page 10.